Alefacept, an immunomodulatory recombinant fusion protein composed of the first extracellular domain of LFA-3 fused to the human IgG1 hinge, CH2, and CH3 domains, has recently been shown in phase II and III clinical trials to safely reduce disease expression in patients with chronic plaque psoriasis. Alefacept modulates the function of and selectively induces apoptosis of CD2+ human memory-effector T cells in vivo. We have sought to gain further understanding of the mechanisms of action that influence the biological activity of alefacept and may contribute to its efficacy and patient responsiveness. Specifically evaluated is the ability of alefacept to activate intracellular signals mediated via CD2 and/or FcγRIII (CD16). Experimentation using isoforms of alefacept engineered to have amino acid substitutions in the IgG1 CH2 domain that impact FcγR binding indicate that alefacept mediates cognate interactions between cells expressing human CD2 and CD16 to activate cells, e.g., increase extracellular signal-regulated kinase phosphorylation, up-regulate cell surface expression of the activation marker CD25, and induce release of granzyme B. In the systems used, this signaling is shown to require binding to CD2 and CD16 and be mediated through CD16, but not CD2. Experimentation using human CD2-transgenic mice and isoforms of alefacept confirmed the requirement for FcγR binding for detection of the pharmacological effects of alefacept in vivo. Thus alefacept acts as an effector molecule, mediating cognate interactions to activate FcγR+ cells (e.g., NK cells) to induce apoptosis of sensitive CD2+ target cells. Despite progress in the clinical development of mAbs and IgG fusion proteins as therapeutics, the mechanism(s) contributing to their efficacy and patient responsiveness is still largely undefined (reviewed in Refs. 1 and 2). Although initial evaluations of Ig-based therapeutics focused on antagonism or agonism of cellular processes mediated upon ligation of the targeted ligand, it is now apparent that the Fc regions of Ig-based agents also may contribute to their biological activity (3, 4). Thus, both regions may be engineered to enhance the therapeutics’ pharmacokinetics and pharmacodynamics to maximize efficacy. More specifically, chemical and genetic modifications can be made to alter the specificity/affinity of binding: 1) to ligand on target cells (5) and 2) of the Ig Fc domains to complement, FcRn, and FcR (6, 7, 8, 9). The three classes of differentially expressed IgG Fc receptors are functionally of two types: the multimeric activation receptors FcγRI (CD64) and FcγRIII (CD16) comprised of both an Fc-binding and a signaling subunit (the immunoreceptor tyrosine-based activation motif), and a inhibitory receptor, monomeric FcγRII (CD32), containing an immunoreceptor tyrosine-based inhibitory motif (6). In this context rational design of the IgG Fc domains of therapeutics can thus select for or against the recruitment of indirect host effects, such as the release of inflammatory cytokines, immune regulation, Ag presentation, target cell death (e.g., complement-dependent cytotoxicity (necrosis) or Ab-dependent cell-mediated cytotoxicity (apoptosis)), endocytosis, and phagocytosis (4, 6). Moreover, engineering of IgG-based therapeutics may address patient-specific factors, such as ligand or Fc receptor polymorphisms, which potentially may differ in control and diseased populations and are likely to be reflected in therapeutic efficacy in vivo. This has been suggested for the therapeutic mAbs Herceptin and Rituxan (both from Genentech, South San Francisco, CA), specific for the signaling receptors c-erbB-2 and CD20, respectively (10, 11, 12). Initially it was postulated that the therapeutic activities of these mAbs might derive solely from the agonistic or antagonistic functions mediated upon binding of their complementarity-determining regions to their molecular target on cells. More recent data from experimental models suggest that the molecular mechanism(s) underlying the biologic activities of Herceptin and Rituxan (4) and alefacept, the CD2 receptor-specific therapeutic LFA-3/IgG1 fusion protein (13, 14), may also reside with IgG Fc-recruited host effector functions, including the activation of apoptosis and Ig-dependent cellular cytotoxicity (e.g., ADCC). As such, clinical and experimental exploration of the relative benefits of human Fcγ isoforms of such therapeutic constructs that differ with regard to their ability to mediate effector functions are prescribed. 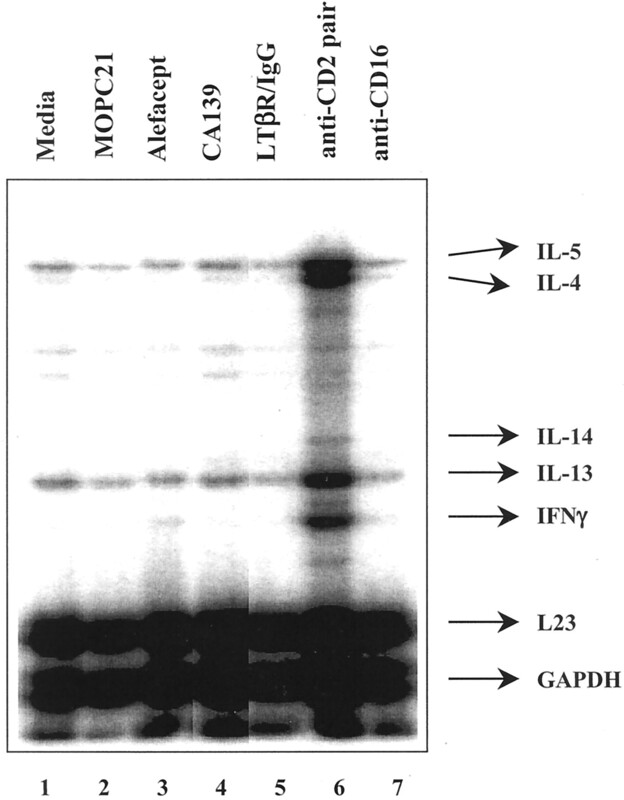 Alefacept (human LFA-3/IgG1 fusion protein), previously referred to as LFA3TIP, is an immunomodulatory recombinant fusion protein composed of the first extracellular domain of LFA-3 fused to the human IgG1 hinge, CH2, and CH3 domains (13). LFA-3 (CD58) is the primary physiologic ligand for human CD2 and is expressed on many cell types, including APCs (reviewed in Ref. 15). In contrast, human CD2 has a more restricted distribution, being detected primarily on T cells and NK cells (reviewed in Ref. 16), with elevated expression noted on activated or memory-effector CD45RO+ T cells (17, 18, 19). Engagement of CD2 on responder T or NK cells by LFA-3 on accessory cells costimulates immune responses potentially by improving the avidity of cellular interactions or by mediating activating signals in the responder cells (15, 16). Indeed, anti-CD2 mAbs and soluble forms of LFA-3, including LFA-3/IgG1 fusion proteins, have been shown to costimulate T cell activation and proliferation under certain experimental conditions (20, 21). Additionally, however, both alefacept and Abs specific for human CD2 and human LFA-3 have been shown to inhibit T cell activities in vitro and in vivo (13, 14, 22). Recently, alefacept as a monotherapy has been shown in phase II and III clinical trials to reduce disease expression safely in patients with chronic plaque psoriasis (23) (M. Lebwohl, E. Christophers, R. Langley, J.-P. Ortonne, J. Roberts, C. E. M. Griffiths, and the Alefacept Clinical Study Group, manuscript in preparation and G. Krueger, K. Papp, D. Stough, K. Loven, W. Gulliver, C. Ellis, and the Alefacept Clinical Study Group, manuscript in preparation), consistent with reports that T cells are central to the underlying pathogenesis (24, 25). The clinical trial data show that alefacept targets the memory-effector CD45RO+ T cells thought to be responsible for disease activity and induces sustained remissions that are maintained even after therapy is withdrawn. Herein, we report investigations evaluating the biological activities of alefacept by employing wild-type and Fcγ isoforms of alefacept in vitro and in vivo to gain understanding of mechanisms that may contribute to the efficacy of and patient responsiveness to alefacept. Human PBL were separated from freshly drawn blood using Ficoll-Hypaque (ICN Biomedicals, Aurora, OH) gradient centrifugation, as previously described (14). NK cells were then enriched using anti-CD3-coated magnetic beads and a Miltenyi Biotec MACS column, following the manufacturer’s instructions (Miltenyi, Auburn, CA). Up to 1 × 109 PBL were bound to the anti-CD3-coated beads and passed over the MACS column. The CD3− cells were collected, washed, and run over the same column. The yield of CD3− cells was approximately 10%. This population was cultured (50,000–100,000 cells/well) with irradiated feeders (200,000/well human PBLs exposed to 3000 rad) in wells of 96-well, round-bottom plates using Iscove’s (Life Technologies, Grand Island, NY), 10% AB-matched human serum (BioWhittaker, Walkersville, MD), 1% glutamine, 1% penicillin/streptomycin (Life Technologies), 5.0 μg/ml PHA (Difco, Detroit, MI), and 100 U/ml rIL-2 (R&D Systems, Minneapolis, MN). Cells were fed on day 2 and restimulated on day 5 with irradiated feeders using medium without PHA, but with 5% (v/v) purified IL-2 (Hemagen, Columbia, MD). Cells were fed every other day until growth in the well was obvious, at which time cells were split 1:1. NK cell culture can continue up to approximately 30 days after the initiation of culture. Phenotypic analyses of in vitro-cultured NK cells demonstrated that the cells were >90% NK cells (CD2+, CD56+, CD16 (FcγRIII)+, CD3−; data not shown) at approximately 2–3 wk after the initiation of culture. T cells were also prepared by culturing Ficoll-Hypaque gradient-separated human PBL (2 × 106/ml) with OKT3 (10 ng/ml) in complete RPMI (Life Technologies) for 3 days. Cells were then split 1:1 using complete RPMI supplemented with recombinant human IL-2 (5 ng/ml). After 2 additional days of culture, cells were used for cell death studies. Cultures were maintained in the IL-2-supplemented medium for up to 21 days. The U937 monocytic cell line expressing CD64 (FcγRI) and CD32 (FcγRII) and the CD2+ CHO transfectants have been described previously (14). The CD2+CD3+CD16− Jurkat tumor T cell line was originally obtained from Dr. Steve Burakoff (Dana-Farber Cancer Institute, Boston, MA). CD2+CD3−CD16+ (FcγRIII+) Jurkat cells, obtained from Dr. Paul Anderson (Dana-Farber Cancer Institute, Boston, MA), have been described previously (14, 26). Subsequently, variants of Jurkat cells were generated by transfecting the CD2+CD3+CD16− Jurkat E6- 1 clone (ATCC TIB-152; American Type Culture Collection, Manassas, VA) with a CD16 cDNA inserted into the pEF-BOS-derived vector (27). The CD16 cDNA was generated by RT-PCR from RNA extracted from the CD16+ Jurkat cells (26). Cotransfections were conducted by electroporation of the CD16 construct with a vector carrying the neomycin resistance gene (pGX-N28) for positive selection. Stable transfectants were isolated and expanded by selection with geneticin (G418 sulfate). The cells were then sorted by FACS to isolate populations observed to be phenotypically CD2−CD3+CD16+ or CD2+CD3+CD16−. The expressed recombinant CD16 is expected to form a heterodimeric receptor complex with the TCR ζ-chain to allow for CD16-generated signaling cascades (6, 26). These cells were transiently transfected with a reporter gene construct (NFAT-luciferase; Clontech, Palo Alto, CA) and assayed as described below. Alefacept is composed of the first extracellular domain of LFA-3 fused to the hinge, CH2 domain, and CH3 domain of human IgG1. Its construction, expression, and purification have been described previously (13). Constructs encoding fusion proteins identical with alefacept, but with mutations encoding amino acids substitutions at alefacept positions 106, 107, and 109, which correspond to amino acid positions 234, 235, and 237 (according to European Union numbering) of the human IgG1 CH2 domain, or only at alefacept position 107 (amino acid 235 of human IgG1) were also prepared. These constructs, designated CA139 and L107E, respectively, were expressed transiently in CHO-S cells, and the proteins derived were purified on a protein A column (Amersham/Pharmacia, Piscataway, NJ). The concentration was determined as the absorbance at 280 nm divided by the extinction coefficient (1.47). CA139 has the following amino acid substitutions in the alefacept IgG1 CH2 domain: leucine to alanine at alefacept position 106, leucine to glutamic acid at position 107, and glycine to alanine at position 109. L107E has only the leucine to glutamic acid substitution at alefacept position 107. A lymphotoxin β receptor (LTβR)/IgG1 fusion protein possessing the same human IgG1 Fc hinge, CH2, and CH3 regions as alefacept was employed as a control in the studies herein (28). The human CD2-specific mAbs GD10 and CB6, both murine IgG1, were prepared at Biogen (Cambridge, MA) using standard techniques. Briefly, RBF mice were immunized via the i.p. route simultaneously with CFA and 4 × 106 CHO transfectants expressing human CD2. Mice were boosted five times via the i.p. route at 2- to 3-wk intervals with both 4 × 106 CD2+ CHO transfectants and IFA. Three days after the fifth boost, mice with sera exhibiting human CD2-specific Abs received an i.p. injection of CD2+ CHO transfectants and were then sacrificed, and their spleen cells were harvested and fused to APRT-P3X.653 myeloma cells. After hybridomas were selected in medium containing adenine-aminopterin-thymidine, hybridoma supernatants were screened for binding to CD2+ Jurkat cells. Selected hybridoma subclones were grown in BALB/c mice as ascetic tumors, and Abs were purified by protein A-Sepharose chromatography following standard procedures. The agonist human CD3-specific mAb OKT3 is a murine IgG2a (ATCC). The agonist anti-CD16 mAb (murine IgG1, clone 3G8) was purchased from BD PharMingen (San Diego, CA) and Medarex (Annandale, NJ). The Fas (CD95)-specific murine IgM mAb CH11 was purchased from Kamiya Biomedical (Seattle, WA). The blocking human CD2 specific mAb TS2/18 was gift from Dr. T. Springer (Harvard Medical School, Boston, MA). A murine IgG1 and the control MOPC21, a murine IgG1, were purchased from Sigma (St. Louis, MO). Male and female 2- to 3-mo-old transgenic mice expressing one copy of the human CD2 gene received one i.v. injection of a 100-μl volume of fusion protein. Mice were bled on the day after injection. PBL were stained using FITC-conjugated Abs specific for human CD2 (Leu 5b; BD Biosciences, San Diego, CA) and murine CD3 (mAb 145-2C11, purchased from PharMingen), which are T cell markers, and with a FITC-conjugated Ab specific for murine IgM (Jackson ImmunoResearch Laboratory, West Grove, PA), which is a marker for B cells. Cell staining was evaluated by flow cytometry. Binding assays were performed as described previously (19). In vitro IL-2-expanded NK cells (3 × 105) were incubated at room temperature for 30 min with various concentrations of alefacept as indicated in the figure or with commercially available CD-specific mAb reagents to which a fluorescent tag was directly conjugated. To detect alefacept binding, cells were then washed twice with PBS and 0.5% BSA and incubated with a 1/200dilution of PE-conjugated goat anti-human IgG (Jackson ImmunoResearch Laboratories) for 30 min at room temperature. Cells were then washed twice, fixed with 1% paraformaldehyde, and analyzed by flow cytometry using a FACSCalibur flow cytometer (BD Biosciences). Ten thousand events were monitored. Reagents specific for human CD2, CD16, CD3, CD25, CD69, and Fas (CD95) used for flow cytometry were purchased from PharMingen. To detect NK cells, PBL were stained with FITC-conjugated mouse anti-human CD16 and CyChrome-conjugated mouse anti-human CD56 (BD PharMingen). Data are expressed as the median fluorescent channel intensity. An ELISA for detection of granzyme B in supernatants derived from stimulated NK cells was based on that previously reported (29). Briefly, purified mAb GB11 (Research Diagnostics, Flanders, NJ) specific for granzyme B was coated (50 mM sodium carbonate/bicarbonate coating buffer, pH 9.6, 16 h at 4°C) on the wells of Nunc Polysorp immunoplate (Copenhagen, Denmark). Following washing (PBS/0.05% Tween 20 and blocking (PBS/2% (w/v) milk, 1 h at room temperature), purified granzyme B (Calbiochem, La Jolla, CA) as a standard and samples that had been treated with hyaluronidase (Sigma; 40 μg/ml for 30 min at room temperature) and diluted in PBS were added (100 μl/well), and plates were incubated for 2 h at room temperature. Following washing, the detecting granzyme B-specific Ab, biotinylated GB10 mAb (0.5 μg/ml in PBS/1% normal mouse serum) was added, and plates were incubated for 1 h. Following another wash, the plate was incubated for 30 min with HRP-streptavidin (Jackson ImmunoResearch; 1/20,000 diluted in PBS/1% normal mouse serum). The plate was washed and developed in 100 μl of 0.42 mM 3,3′,5,5′-tetramethylbenzidine in 0.1 M sodium acetate-citric acid, pH 4.9, and 0.003% (v/v) H2O2. The reaction was stopped with an equal volume of 2 N H2SO4 to the wells, and the plate was read on a Microbeta Jet plate reader (Molecular Devices, Menlo Park, CA) at 450 nm. Bridging assays were performed as described previously (14). CHO cells transfected with human CD2 were grown to confluence in wells of flat-bottom, 96-well plates. Wells were washed twice, 50 μl of varying concentrations of fusion protein were added, and plates were incubated for 30 min at 37°C. One hundred thousand U937 cells (expressing CD64 and CD32) or 105 CD16+ Jurkat cells labeled with 2-7-bis-(2-carboxyethyl)-5-(and-6)-carboxyfluorescein acetoxymethyl ester (Molecular Probes, Eugene, OR) according to the manufacturer’s directions were then added in 50 μl to wells. Plates were incubated for 30 min at 37°C. Wells were then washed up to four times. Background signal was that of wells with cells but without added fusion protein, incubated and washed as were the experimental groups. Total input signal was defined as the fluorescence signal released from 105 BCECF-AM-labeled cells. The percent binding was determined as the (observed − background)/(total input − background) fluorescence × 100. Human PBL (1–2 × 105/well) were suspended in complete medium (RPMI 1640 supplemented with 10% heat-inactivated FBS, 1% HEPES, 1% penicillin (100,000 U/ml), 1% streptomycin (10,000 μg/ml), and 2% glutamine (200 mmol/l)) and cultured in 96-well microtiter plates. PHA or irradiated (10,000 rad) human allogeneic JY tumor B cells serving as APC were added, and plates were incubated at 37°C in 5% CO2. MLR were incubated for a total of 6 days. PHA-induced proliferation assays were incubated for a total of 3 days. Wells were pulsed with 1 μCi tritiated thymidine ([3H]TdR; Amersham) for 18 h before harvesting cells onto glass-fiber filters using a MASH harvester (Tomtec, Orange, CT). Radioactivity incorporated was measured using a liquid scintillation counter (Wallac, Gaithersburg, MD). Cell death was measured by flow cytometry or in standard cell-mediated cytotoxicity assays. Death of in vitro IL-2 expanded NK or T cells or of Jurkat cells, which had been stimulated as described in Results, was detected by staining with FITC-annexin followed by flow cytometric analyses. Cell death was also measured in nonradioactive standard cell-mediated cytotoxicity assays using a commercially available kit (CytoTox96; Promega, Madison, WI). Briefly, 30,000 NK cells in 0.1 ml were added to wells of round-bottom, 96-well microtiter plates. Fusion proteins were added to wells at the concentrations shown in the figures to make a total volume of 0.2 ml/well. The microtiter plates were incubated (37°C, 5% CO2) for 4 h, and then 0.05 ml supernatant was removed for measurement of released lactic dehydrogenase (LDH)3 according to kit instructions, and absorbance was read at 490 nm in a Molecular Devices Spectramax Plus plate reader. Spontaneous release (SR) is LDH released from the cells in the presence of medium alone, and maximum release was that released from the cells incubated in the presence of 9% Triton X-100. Percent lysis was calculated as ((experimental − SR)/(maximum release − SR)) × 100. Concanamycin A (Sequoia, St. Louis, MO), an inhibitor of vacuolar type H+-ATPase thus perforin-based cytotoxic activity (30), was employed at a 50-nM concentration. Granzyme B-mediated cell death is referred to herein as apoptosis (contrasting with necrosis mediated by the complement membrane attack complex), as it is known to activate the caspase cascade in target cells to cause cell death. Jurkat cells (2 × 106 cells in 1 ml RPMI medium with 2% FBS) were treated in vitro for 12 min at 37°C with either fusion proteins or mAbs as indicated in the figure legends. Following stimulation, cells were sedimented by brief centrifugation, and the pellet was resuspended in 100 μl of a hypotonic solution (10 mM Tris and 1 mM EDTA buffer). After addition of an equal volume of gel loading buffer, cell extracts were separated by 12.5% SDS-PAGE and transferred to polyvinylidene difluoride membranes (Millipore, Bedford, MA), and the samples were subjected to immunoblotting with phospho-specific Abs to p42/44MAPK specific for activated kinase. Blots were developed using the ECL system and were visualized by exposure to x-ray film. Autoradiographs were scanned using a densitometer. Cells (2 × 107 cells in 400 μl) were transfected with 80 μg pNFAT-luciferase reporter gene construct (Stratagene, La Jolla, CA) and then diluted into 20 ml RPMI medium supplemented with 10% FBS and incubated (5% CO2, 37°C) overnight. To measure the induction of luciferase expression, cells were treated with either a combination of PMA (Calbiotech, La Jolla, CA) and ionomycin (Calbiotech) at concentrations of 0.1 and 5 μg/ml, respectively, or with mAbs and fusion proteins in wells of a 96-well, round-bottom well plate. Following 4–6 h of incubation (5% CO2, 37°C), the plate was centrifuged (800 × g for 5 min), the cells were lysed in 100 μl of 1× reporter lysis buffer (Promega, Madison, WI) for 10 min while being shaken at room temperature. The cell lysates (40 μl) were transferred into wells of a white isoplate, 75 μl luciferase substrate was added to each well, and after 1 s the luminescence was counted for 1 s using a Microbeta jet reader (Wallac, Gaithersburg, MD). The data are expressed as corrected light units per second (CLPS). The signal was normalized by dividing the CLPS values for each experimental well by the average CLPS value of the OKT3-treated sample and then multiplied by 100. Thus, the signals are represented as a percentage of the CD3-stimulated signal. IL-2-expanded NK cells were incubated for 48 h in fresh medium containing 5% IL-2 (purified), after which they were incubated with the various mAbs and fusion proteins in the same conditioned medium. Thirty × 106 cells were used per experimental condition. After 4 h of incubation at 37°C, cells were harvested, and RNA was extracted (Qiagen, Valencia, CA). To perform the RPAs, 10 μg of each RNA sample was then hybridized overnight separately with three [33P]dCTP (Amersham)-labeled probe sets: huCK-1 (cytokines), and APO-3 and APO-4 (apoptotic genes) as indicated by the manufacturer (BD PharMingen). The RNA/probe hybrids were then treated with RNase A to digest unprotected RNA. After proteinase K treatment, the RNase digests were phenol extracted once, precipitated with ethanol, and separated by QuickPoint acrylamide gel electrophoresis (Novex, San Diego, CA). Labeled probes were visualized by autoradiography, and the intensity of the signal was measured with a Storm 860 PhosphorImager scanner (Molecular Dynamics, Sunnyvale, CA). Hybridization signals for the individual mRNA species were then normalized against the mean value obtained for the GAPDH/L23 signals (×100) within each experimental sample. Hence, the detected expression levels for the genes of interest are expressed relative to the expression levels observed for two housekeeping genes. Individual mRNA species were identified against labeled standards following the manufacturer’s procedures. To investigate the role of the IgG1 Fc portion and cell-expressed FcγR (particularly FcγRIII, CD16) in the functional activity of alefacept, two isoforms expressing mutations in the human IgG1 CH2 domain of the fusion protein were generated. These isoforms, designated L107E and CA139, were mutated, respectively, at IgG1 H chain aa position 235 only or at 234, 235, and 237 (employing the European Union nomenclature). These amino acid substitutions are expected to abrogate binding to FcγR (31, 32). Initial experiments compared the binding of alefacept and CA139 to freshly drawn human peripheral blood T cells or to in vitro IL-2-expanded human NK cells that express CD2 and CD16 (Fig. 1⇓, A and B, respectively). Bound fusion proteins were detected using flow cytometry. The concentration range for saturation binding was not addressed in these experiments, as equilibrium conditions were not established. The shapes of the binding profiles of alefacept and CA139 to T cells (detected in Fig. 1⇓A as CD2+CD16−CD56− peripheral blood cells) were similar in that binding is detected primarily at high (>100 μg/ml) and less so at lower (1–100 μg/ml) alefacept concentrations. In contrast, alefacept binds to the in vitro cultured NK cells (which are CD2+CD16+, Fig. 1⇓B) at high as well as lower concentrations. CA139 (which binds CD2, but not CD16; see below) appears to bind better at higher and less well at the lower fusion protein concentrations. The binding of both fusion proteins (at all concentrations tested) is inhibited by 15 μg/ml of the CD2-specific mAb TS2/18, but not by isotype control murine IgG1 MOPC21 (Fig. 1⇓B). These data are consistent with published results (19) showing that high avidity binding at the lower alefacept concentrations reflects binding to both CD2 and CD16, and low affinity binding at higher alefacept concentrations reflects LFA-3 binding to CD2 only. Alefacept binding mediates cognate interactions between CD2+ and FcR+ cells to inhibit T cell proliferation. A, Binding of alefacept or its isoform CA139 to T cells (CD56−CD16− peripheral blood cells) was detected by immunofluorescent staining with a PE-conjugated anti-human IgG (HuIgG). Median fluorescent channel intensity (MFCI) values are plotted vs ligand concentration. B, In vitro expanded NK cells were preincubated with the CD2-specific mAb TS2/18 (15 μg/ml) or isotype control MOPC21 (66 μg/ml), then incubated for an additional 30 min at room temperature with alefacept or CA139 (at the final concentrations shown on the x-axis) and washed twice, and bound alefacept or CA139 was detected. C and D, Monolayers of CD2-transfected CHO cells were incubated with the indicated concentrations of alefacept, CA139, or L107E. BCECF-AM-labeled CD32+, CD64+ U937 (C), or CD16+-transfected Jurkat cells (D) were then added, and incubation was continued. Following washing, plates were read at 485/530 nm to determine the percentage of cell bridging. E and F, Human PBL were cultured with PHA (E) in the presence of the reagents designated on the x-axis at the concentrations shown in the legend for a total of 3 days, or were coincubated (F) with irradiated JY B tumor cells serving as APC in the presence of the reagents on the x-axis for a total of 6 days. Wells were pulsed with 1 μCi [3H]Tdr for 18 h before harvesting cells; the radioactivity incorporated was measured using a liquid scintillation counter. Next we tested the ability of alefacept, CA139, or L107E to mediate intercellular bridging of plate-adherent CD2+ CHO transfectants to fluorescently labeled CD64+ CD32+ (FcγRI and FcγRII, respectively) U937 cells or CD16+ (FcγRIII)-transfected Jurkat cells (14). As shown in Fig. 1⇑C, alefacept mediates intercellular bridging, whereas both CA139 and L107E failed to bridge in assays employing U937 cells. In contrast, both alefacept and L107E mediated intercellular bridging of CD16+ Jurkat cells to CD2+ CHO transfectants, and CA139 failed to bridge CD16+ Jurkat cells to CD2+ CHO transfectants (Fig. 1⇑D). Thus, the mutations in CA139 abrogated bridging of CD2+ cells to either CD64+CD32+ cells or CD16+ cells, whereas the mutation in L107E abrogated bridging of CD2+ cells only to CD64+CD32+ cells, leaving bridging to CD16+ cells intact. The effects of alefacept, L107E, and CA139 on human T cell proliferation in vitro were evaluated. Fig. 1⇑, E and F, shows, respectively, the effects of addition of various concentrations of the fusion proteins to cultures of human PBL induced to proliferate in response to PHA and in allogeneic MLR employing as stimulators the JY human B cell line. Both alefacept and L107E inhibited T cell proliferation comparably in such assays. In contrast, CA139 had little effect. This pattern confirms a role for CD16 binding as well as CD2 binding in alefacept inhibition of T cell proliferation (14). As T and B cells do not express CD16, it is likely that the required CD16+ cells are NK cells or macrophages in the responder PBL preparation. With regard to alefacept’s effects on T cells in vivo, it has previously been shown that a single injection of ≥50 μg (∼2.5 mg/kg) alefacept into human CD2 transgenic mice diminished human CD2+ murine T cells in the blood and secondary lymphoid tissues by a mechanism that does not require complement but is dependent on the expression of the IgG1 CH2 domain by the fusion protein (14). Human CD2 transgenic mice were used, as the endogenous murine CD2 does not bind human LFA-3 expressed in alefacept (14); in fact, the receptor for murine CD2 is murine CD48 (33), and an LFA-3(CD58) equivalent has not been identified in mice. The data from a representative experiment (Table I⇓) show that administration of 50 μg alefacept or L107E eliminated peripheral human CD2+ T cells from human CD2+ transgenic mice. The percentage of peripheral blood (human CD2+, murine CD3+) T cells observed on days 2 and 3 postdosing was 0 or 1%, compared with approximately 35% human CD2+ and murine CD3+ T cells in untreated mice. The percentage of PBL that were IgM+ B cells was >85% in the alefacept- and L107E-treated mice compared with approximately 50% in untreated mice, showing a corresponding increase in the percentage of B cells as the T cell counts decreased. In contrast, administration of CA139 to human CD2 transgenic mice had no effect on peripheral T cell counts. ELISA analyses of plasma samples taken from the mice at the time of the flow cytometric analyses showed approximately equivalent fusion protein concentrations (data not shown). Thus, CA139, which binds to CD2, but not to human, CD64, CD32, and CD16, fails to reduce, whereas the L107E mutant, which binds human CD2 and human CD16, is able to reduce peripheral T cell counts in human CD2 transgenic mice comparably to alefacept. Thus, this in vivo effect of alefacept on peripheral T cells requires that the fusion protein bind to cells that express the murine homologue of human FcγRIII, but not FcγRI or FcγRII, and cells that express human CD2. As published data indicate that anti-asialo GM1 pretreatment of human CD2 transgenic mice to remove NK cells did not abrogate alefacept’s activity (14), other FcγR+ murine cells, e.g., macrophages, may also mediate alefacept’s effect on T cells in these mice. As the studies reported above and previously show a role for LFA-3 and human IgG1 Fc binding, respectively, to CD2 expressed on T (and NK) cells and the CD16 expressed by NK cells and potentially macrophages in alefacept’s effects on T cell proliferation in vitro and on peripheral T cell counts in vivo, it was of interest to evaluate the effect of the fusion protein directly on CD16-expressing cells. For this purpose we employed a homogeneous population of primary cells that express CD16, which are capable of lytic function. Specifically, the effect of alefacept and its mutant isoforms on in vitro propagated CD16+CD2+ NK cells was examined. Initially, alefacept was tested for its ability to induce apoptosis of human NK or T cells. Relatively homogeneous preparations of in vitro IL-2-expanded NK or T cells were incubated with various concentrations of alefacept, CA139, anti-CD16 mAb, or their isotype controls, human LTβR/IgG1 Fc-fusion protein (LTβR/IgG1), and MOPC21. Following incubation, the cells were collected and stained with FITC-conjugated annexin V. An increase in the percentage of cells binding annexin V represents an increase in apoptotic cells, as annexin V binds phosphatidyl serine, which is known to flip from the inner to the outer membrane of the cytoplasmic membrane when cells undergo apoptosis. As shown in Table II⇓, incubation of NK cells with alefacept or the CD16-specific mAb, but not CA139, LTβR/IgG1, or MOPC21, resulted in a substantial increase in the percentage of NK cells that bind annexin V. In a parallel experiment using the homogeneous preparations of IL-2-expanded T cells (that lack CD16 expression on the surface), the T cell population was induced to undergo apoptosis by camptothecin and Fas- or CD2-specific mAbs, but not by either alefacept or CA139 (data not shown). This indicates that alefacept is able to induce apoptosis of in vitro IL-2-expanded NK cells, but not that of in vitro IL-2-expanded T cells. As the CD16-specific mAb, but not the control LTβR/IgG1 fusion protein or CA139, also induced NK cell apoptosis, the data indicate that CD16 binding by mAb alone is sufficient to mediate such activity, but that alefacept must bind both CD2 and CD16 to mediate its effect. Similarly, but less impressively, in studies employing Jurkat cells, CD2+CD2+CD16+ Jurkat transfectants incubated with alefacept, but not CA139, were induced to undergo apoptosis (Table III⇓). In contrast, Jurkat cells expressing CD2, but not CD16, were not induced by alefacept to undergo apoptosis (Table III⇓). The molecular mechanisms contributing to alefacept-induced apoptosis of sensitive CD2+ cells were evaluated. First, the ability of alefacept to induce NK cells to secrete granzyme B was assessed. The results shown in Table II⇑ demonstrate that the addition of various concentrations of alefacept or the CD16-specific mAb, but not CA139 or LTβR/IgG1, to cultures of NK cells induces the secretion of granzyme B. To evaluate whether this may contribute to alefacept-stimulated NK cell apoptosis, concanamycin A was used in 4-h cytotoxicity assays. Concanamycin A is an inhibitor of vacuolar type H+-ATPase and inhibits perforin-based cytotoxic activity primarily due to accelerated degradation of perforin by an increase in the pH of lytic granules. In a representative experiment shown in Fig. 2⇓A, IL-2-expanded NK cells were incubated with alefacept or the control protein LTβR/IgG1 for 4 h in the presence or the absence of concanamycin A, and cytotoxicity was measured as an increase in the release of LDH by the NK cells. The data show that concanamycin A almost completely inhibited alefacept-induced NK cell death detected in 4-h cytotoxicity assays. Thus, in these IL-2-expanded NK cells, alefacept appears to induce apoptosis by a mechanism that is mediated primarily by granzyme B. By contrast concanamycin A only partially reduced NK cell lysis of K562 target cells (data not shown), consistent with published data suggesting that NK cell-mediated lysis of K562 cells reflects the activity of both the perforin/granzyme B and the Fas ligand/Fas death receptor pathways (34). Attempts to investigate the induction of caspase activity in response to alefacept or control fusion proteins or mAbs were difficult due to high levels of endogenous caspase activity observed in these in vitro IL-2-expanded NK cells (data not shown). Alefacept induces activation and concanamycin A-inhibitable cytolysis of NK cells. A, In vitro IL-2-expanded NK cells (day 29) were preincubated (or not) for 2 h with 50 nM CMA. These cells were then further incubated with the indicated concentration of fusion proteins for 4 h. Supernatants were removed to allow the measurements of released LDH as a means of quantitating cell lysis. B, In vitro expanded NK cells (day 21) were incubated for 20 h with medium alone or with 10 μg/ml alefacept, CA139, LTβR/IgG1, anti-CD2 mAbs (10 μg/ml each), or anti-CD16 mAb (5 μg/ml). Cells were washed and then stained with PE-conjugated anti-human CD25 (upper panel) or anti-human Fas (CD95) (lower panel). Cells stained with anti-human Fas were washed and subsequently stained with PE-conjugated goat anti-mouse IgG. Cells were washed again, and the immunofluorescent staining was detected. MFCI, Median fluorescent channel intensity. Alefacept induces activation of and intracellular signaling in in vitro IL-2-expanded NK cells that is dependent on CD2 and CD16 binding. We next considered that alefacept-mediated apoptosis of NK cells (Fig. 2⇑) may reflect activation-induced intracellular processes similar to the apoptosis of IL-2-activated NK cells stimulated by anti-CD16 mAb (35) or anti-CD2 mAbs (36, 37). Thus, we investigated whether alefacept has agonistic properties. NK cells were incubated with 10 μg/ml alefacept or control proteins for 20 h in the presence of IL-2 and then analyzed by flow cytometry for the expression of activation markers CD25, and CD95 (Fas). The results show that incubation of NK cells with alefacept, anti-CD2 mAbs, or anti-CD16 mAb, but not CA139 or LTβR/IgG1, resulted in up-regulation of the expression of CD25 (Fig. 2⇑B, upper panel), but not CD95 (Fig. 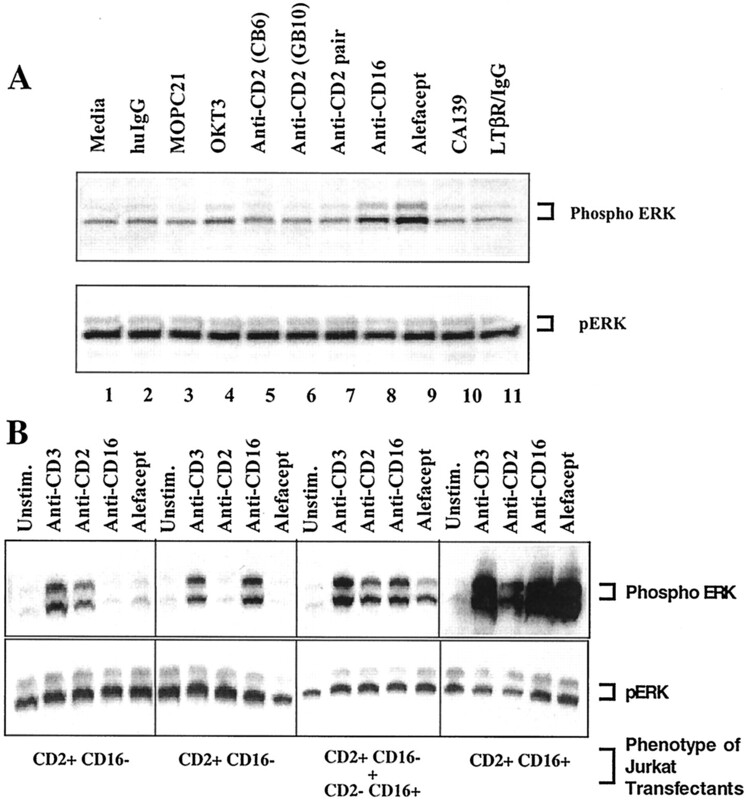 2⇑B, lower panel), which is already highly expressed by these in vitro IL-2 expanded NK cells (Fig. 2⇑B, lower panel). Such an agonistic effect of alefacept on IL-2-expanded human T cells was not noted (data not shown). Since both CD2 and CD16 can be engaged to induce intracellular signaling in NK cells (38, 39), the ability of alefacept to induce signaling in in vitro IL-2-expanded NK cells was evaluated (Fig. 3⇓A). 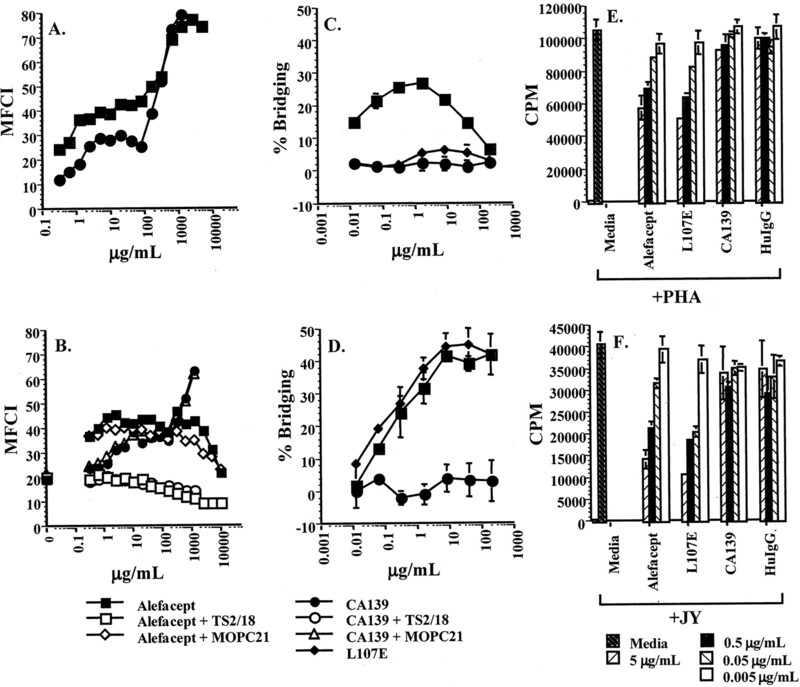 Incubation of these NK cells with alefacept, but not CA139 or LTβR/IgG1, increased the levels of p42/44MAPK (ERK) phosphorylation approximately 21-fold compared with cells exposed to medium alone (Fig. 3⇓A and data not shown). The anti-CD16 mAb also stimulated increased ERK activation (∼18-fold). In contrast, whereas neither the IgG controls (human IgG, MOPC21, and LTβR/IgG1), the anti-CD3 mAb, nor the anti-CD2 mAbs induced activation of ERK in these IL-2-expanded NK cells, even though the anti-CD2 and anti-CD3 mAbs induced high levels of ERK activation in Jurkat cells (see below, Fig. 3⇓B). This indicated that coengagement of CD16 and CD2 by alefacept is required to induce NK cell signaling. Alefacept induction of ERK activation requires binding to both CD2 and CD16. In vitro IL-2-expanded NK cells that were cultured overnight in IL-2-free medium to bring the cells to a quiescent state (A) or the designated Jurkat transfectants as indicated (B) were incubated for 12 min at 37°C with the proteins or mAbs (5 μg/ml each) indicated. Cell lysates were separated by SDS-PAGE, transferred to polyvinylidene difluoride membranes, and probed with rabbit serum specific for phosphorylated ERK (phospho ERK, top gel) or total ERK (pERK, lower gel). Signals were visualized by chemiluminescence and autoradiography. huIgG, Human IgG; Unstim., unstimulated. To determine whether alefacept is capable of inducing ERK activation when CD2 or CD16 are expressed on the same or apposing cells, Jurkat transfectants were employed. As shown in Fig. 3⇑B, alefacept induced ERK activation in CD2+CD16+ Jurkat transfectants or when CD2+CD16− and CD2−CD16+ Jurkat transfectants were cocultured. In contrast, ERK activation was not induced when alefacept was incubated with either the CD2+CD16− Jurkats alone or CD2−CD16+ Jurkat transfectants alone, although these CD3-, CD2-, or CD16-specific mAbs did induce ERK activation in the Jurkat transfectants expressing the corresponding CD3, CD2, or CD16 cell surface molecule (Fig. 3⇑B). Incubation of the CD2+CD3+CD16+ Jurkat transfectants with an isotype control fusion protein (LTβR/IgG1) or with CA139 failed to induce ERK phosphorylation (data not shown). These results showed again that alefacept must bind to both CD2 and CD16 to induce ERK activation consistent with the data generated with the IL-2-expanded NK cells (Fig. 3⇑A). Importantly, the data demonstrate a functional consequence (ERK activation) of alefacept-mediated cognate interactions between CD2 and CD16 expressed on different cells. To distinguish whether alefacept induced signaling of Jurkat cells via CD2, CD16, or both, the same stably transfected CD2+CD2+CD16− and CD2−CD2+CD16+ Jurkat cells were transiently transfected with a pNFAT-luciferase reporter construct. The reporter-expressing Jurkat transfectants were then cultured either individually or with the reciprocal untransfected cells in the presence of alefacept or mAbs specific for either CD2, CD16, or CD3. As shown (Fig. 4⇓), when cultured individually in the presence of alefacept or CA139, neither pNFAT-luciferase Jurkat transfectant was stimulated to activate NFAT. Alefacept (but not CA139) induced NFAT activation when the CD2−CD3+CD16+ Jurkat cells transfected with the reporter construct were cocultured with untransfected CD2+CD3+CD16− cells (Fig. 4⇓B). 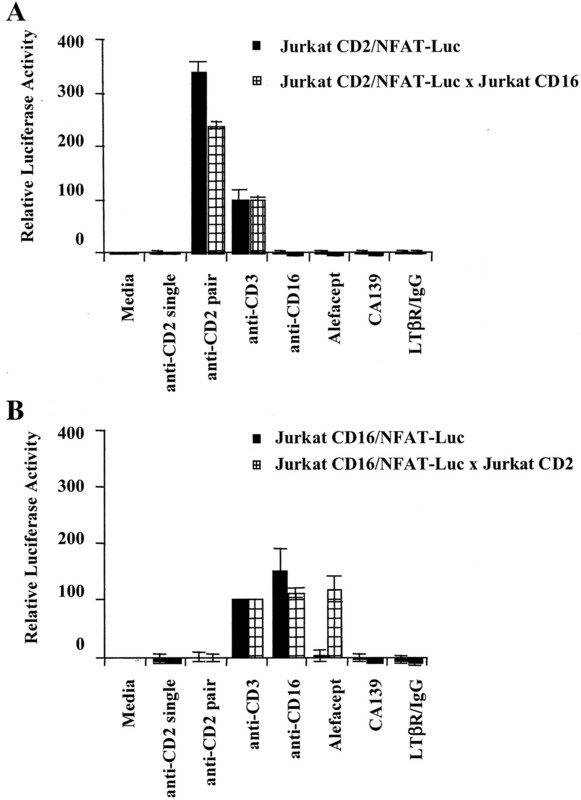 In contrast, alefacept did not activate NFAT when pNFAT-luciferase transfected CD2+CD3+CD16− Jurkat cells were cultured with untransfected CD2−CD3+CD16+ Jurkat cells (Fig. 4⇓A) even though the CD2-specific mAbs activated NFAT in these reporter cells. Thus, in this Jurkat model system alefacept-induced signaling is primarily mediated by the interaction of its Fc portion with CD16. 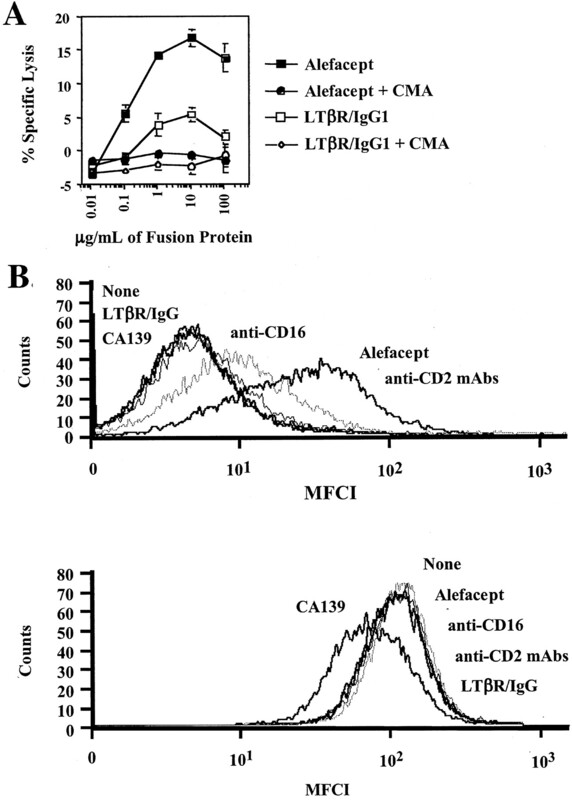 Although binding of the LFA-3 portion of alefacept to CD2 alone, as in the case of CA139, was not capable of inducing NFAT activity, this CD2/LFA-3 interaction was nevertheless required, since incubation with alefacept, but not a control human IgG1 fusion protein (LTβR/IgG1), induced NFAT activity. Alefacept induces activation signals via CD16, but not CD2, in Jurkat cells. A, pNFAT-Luc-transfected CD2+CD3+CD16− Jurkat cells were cultured alone (solid bar) or cocultured with CD2−CD3+CD16+ untransfected Jurkat cells (squared bar) in the presence of 5 μg/ml of the mAbs or the fusion proteins designated on the x-axis. B, pNFAT-Luc-transfected CD2−CD3+CD16+ Jurkat cells were cultured alone (solid bar) or cocultured with CD2+CD3+CD16− untransfected Jurkat cells (squared bar) in the presence of 5 μg/ml of the mAbs or fusion proteins designated on the x-axis. After a 6-h incubation, luciferase activity was measured, and the signals were normalized by dividing the CLPS values for each experimental well by the average CLPS value of the anti-CD3-treated sample and then multiplying by 100. Thus, the data are represented as a percentage of the CD3-stimulated signal. RPAs were performed to evaluate whether alefacept was capable of signaling gene expression in these NK cells and how the expressed patterns compared with those induced by stimulation with mAbs specific for CD2 or CD16. Consistent with the cytolytic functions of NK cells, the IL-2-propagated NK cells constitutively expressed high levels of mRNA for granzyme A, granzyme B, and perforin. These were essentially not up-regulated upon stimulation with alefacept (Table IV⇓), except perhaps marginally for granzyme A mRNA. It is possible that the ability of alefacept to up-regulate these mediators is masked by the propagation of these cells with IL-2, since freshly isolated human NK cells constitutively demonstrate only low expression of granzyme B (and high expression of granzymes A and M, and perforin) (40). Constitutive expression levels of mRNA for other molecules involved in apoptotic pathways, such as granzyme H, granzyme 3, rat ventral prostate (androgen withdrawal apoptosis protein), and various TNF family death receptors and their ligands (Fas, Fas ligand, TNF-related apoptosis-inducing ligand, and TNFRp55), were also moderately high in these IL-2-propagated NK cells (Table IV⇓), with only a suggestion of increases in rat ventral prostate mRNA levels upon stimulation with alefacept. Thus, although spontaneous NK cell killing of tumor cell lines, and Ab-dependent (NK/K) cell-mediated cytolysis are reported to be mediated in part by members of the TNF receptor subfamily that express intracellular death domains (41, 42, 43), these data do not provide evidence for their role in the biological activity of alefacept. This may reflect the fact that although these ligands and receptors are expressed on NK cells, they may not have a major role in the induction of apoptosis of the NK cells themselves (37, 43, 44, 45), consistent with the observation (Fig. 2⇑A) that concanamycin A almost completely inhibited the NK cell apoptosis induced by alefacept. The cytokine mRNAs evaluated (IL-4, IL-5, IL-13, IL-14, IFN-γ) were expressed at low or undetectable levels and were shown to be robustly up-regulated when the NK cells were stimulated with the agonistic CD2-specific mAb mitogenic pair (Table IV⇑ and Fig. 5⇓). In contrast, alefacept and anti-CD16 mAb failed to induce the expression of these genes. An apparent slight increase (3- to 4-fold) in the level of IFN-γ mRNA was observed when the NK cells were stimulated with alefacept, anti-CD16, or LTβR/IgG1, but this effect was slight in comparison with the 23-fold change in the expression levels induced by the anti-CD2 agonist mAb pair. These data indicate again, as noted for CD25 up-regulation (Fig. 2⇑B), that these NK cells are not refractory to activation via CD2, but fail to provide evidence for alefacept recruitment of CD2-mediated signaling cascades. Anti-CD2 mAbs, but not alefacept or anti-CD16 mAb, induce cytokine expression in IL-2-expanded human NK cells. The figure depicts a representative RPA experiment using the hCK1 (cytokine) probe set. In vitro IL-2-expanded NK cells were incubated with the mAbs and fusion proteins as indicated for 4 h at 37°C, and the purified RNA was analyzed by RPA. Detection of mRNA species was conducted by acrylamide electrophoresis, followed by autoradiography. Identification of the specific mRNA species was determined as described in Materials and Methods. Taken together the data presented herein suggest that upon coengagement of CD2 and CD16, alefacept induces signals in and stimulates CD16+ (e.g., NK) cells to release granzyme B, which, acting in concert with perforin, induces the activation of substrates, potentially caspases, and consequently apoptosis in ligand-expressing (CD2+) target cells (NK and potentially sensitive T cells). In the case of alefacept-induced NK cell apoptosis, this may be a fratricidal process similar to that previously reported to be induced by a CD2-specific mAb (46). The patterns of ERK activation and gene induction (the RPA data) observed upon CD2 mAb, CD16 mAb, and alefacept induction suggest that in the NK cells employed in the studies herein, alefacept primarily stimulates the CD16 pathway to generate effector functions. This contrasts with data showing that both the Ag and Fc binding domains of Herceptin and Rituxan engage their molecular receptors (c-erbB2, CD20, and FcγR) to induce cellular activation and ADCC (4, 10, 11, 12). This distinction may reflect the fact that Abs typically have 100- to 1000-fold higher affinities for their cellular receptors than does LFA-3 for CD2. In the case of alefacept, the data generated using the Fcγ isoforms suggest that binding to CD2 may function primarily to increase alefacept’s avidity for FcγR on NK cells and/or macrophages and to target their effector functions to sensitive (apposing) CD2+ (T or NK) cells. This is consistent with data showing that CD16+ cells are required for alefacept inhibition of T cell proliferation in MLR (14). These findings are further substantiated by studies employing a variant of alefacept, which was found to be less active in CD2/CD16-mediated bridging assays. Administration of this variant was observed to have lower efficacy in a small clinical trial in psoriasis patients and to have lesser effects on the peripheral T cell counts of monkeys and humans (Biogen, unpublished observations). Together these results suggest that alefacept induces the signaling and activation of the CD16+ cells and cytolysis of sensitive CD2+ cells in vivo, leading to the diminution of peripheral T cell counts in rodents and primates. As in the case of Ab-dependent (NK/K) cell-mediated cytolysis, our data suggest that the signaling pathways that are activated in alefacept-mediated apoptosis involve the membranolytic agent perforin (47, 48) and the granzyme serine proteases. These are released from secretory vesicles in the killer cell cytoplasm into the target cells (49) where the granzymes access intracellular substrates and initiate a caspase-dependent or independent apoptotic cascade (48, 50). Given the higher levels of surface CD2 expression in preactivated or memory/effector T cells (19) and observations that activated cells are more susceptible to apoptotic pathways (51, 52, 53), these cells may be selectively targeted by alefacept, resulting in the selective decrease in the numbers of memory-effector CD2+ CD45RO+ T cells in the blood of psoriatic patients treated with alefacept in clinical trials (23). It should be considered that such alefacept activation of FcγR+ effector cells leading to apoptosis of sensitive CD2+ cells may not be restricted to NK cells, as macrophages also express CD16 and are implied in the effect of alefacept in NK cell-depleted human CD2 transgenic mice (14). Additionally, the potential exists for alefacept to mediate effects via other IgG1 binding FcγR, and in this regard alefacept can induce signaling in CD2+ Jurkat cells that have been transfected with CD64 (data not shown). However, results to date do not provide direct evidence that CD64 influences the biological activity of alefacept. Finally, the definition of the molecular players underlying the cellular and biochemical mechanism(s) influencing the efficacy and patient responsiveness to alefacept may contribute to identifying segments of patient populations likely to derive the most gain from alefacept treatment. The results herein suggest that studies investigating polymorphisms in the molecular targets of alefacept (e.g., CD2, FcγR, particularly CD16, and the participants downstream in its signaling cascade) and their expression in patients undergoing alefacept treatment may reveal correlations with therapeutic efficacy, as has recently been shown for Rituximab (54). We thank Irene Sizing, Donna Hess, and Christopher Benjamin of Biogen, Inc., for their assistance with the generation and characterization of the anti-CD2 mAbs used in this study. ↵1 Alefacept (human LFA-3/IgG1 fusion protein) is currently being developed under the brand name AMEVIVE (Biogen, Cambridge, MA). ↵3 Abbreviations used in this paper: LDH, lactic dehydrogenase; CLPS, corrected light units per second; ERK, extracellular signal-regulated kinase; LTβR, lymphotoxin β receptor; RPA, RNase protection assay; SR, spontaneous release.